It was barely light outside at 8 o’clock this mid-January morning. I was in my bathrobe reading The Olympian, which used to take me as long to read as it took me to drink a cup of coffee. But it has sadly shriveled, like so many daily papers, and this morning it’s a three-sip paper. But I am in the mood to read. With no magazines or books within reach, I stare into the room for a while and look out the east-facing window for signs of the sun. My gaze falls on my tidy stack of Orion magazines, spines facing out, on a shelf across from me. I try to remember what I read in those beautiful, thoughtful, ad-free pages. As a nature writer, I know I found inspiration and camaraderiein every issue, but now the specifics are lost and I just have warm fuzzy feelings about this treasure chest of the finest writing about nature, culture, and place. And about the physical presence of these magazines. Each issue is squarely and tightly bound so that each one stacks neatly on top of the other without sliding off each other and off the shelf the way issues of the New Yorker do. The issues of Orionseem to cling to each other with magnetic force, which is part of the reason they persist on my shelf—unlike the slip-sliding New Yorkers I recycle or tuck into the magazine rack at my local YMCA. The Orions on my shelf are all that’s left from my on-again-off-again subscriptions, plus a few issues I had bought at my local food co-op when I had let my subscription lapse, minus those I had loaned or given away to friends. What was in those particular persistent issues that gave them staying power? What important and urgent ideas had I not taken to heart or acted on? Which writers and stories had I wrongly forgotten? What lovely heart-breaking stories were trapped in those pages that were now reduced to decorative dead weight on my shelf? I walked across the room and kneeled down in front of the Orion stack. There were just fourteen issues covering a decade between 2008 and 2018. I picked up the top three from the stack and returned to the sofa and my coffee. It was time to act. Time to move ideas from the page into the world. Time to move back issues forward. I turned to the front of the magazine and read the Preamble (the editor’s letter) and the Lay of the Land (charming short “reports from near and far.” I became transfixed by a black-and-white image of tree stump. The title is Against Forgetting. The caption tells me the artist joined two images—a wax rubbing of a tree stump and a inked human fingerprint. The wax rubbing is reduced in size and the fingerprint enlarged so the tree’s growth rings and the whorls of skin look uncannily similar. It is a breathtaking illustration. I cannot turn the page. I do not want to cover up the image with the next page. Should I order the book? Track down the artist, Nina Montenegro, and inquire about obtaining a print? How big would such a print be? How much would it cost to frame it? Where would I hang it? Once hung, would I love it for a while and then, after so many months, stop noticing it, stop seeing it, and then forget about it altogether. Is getting a framed print a meaningful response to this piece of art? Do I need to be reminded how much I love trees, intricate patterns in nature and how we are similar to trees in so many other ways? I cut the image out of the page for my friend, Anne. Anne and I share deep druidical respect and passion for trees and forest conservation. We spend much of our time together walking in the woods, admiring trees, and appreciating everythinng they represent. 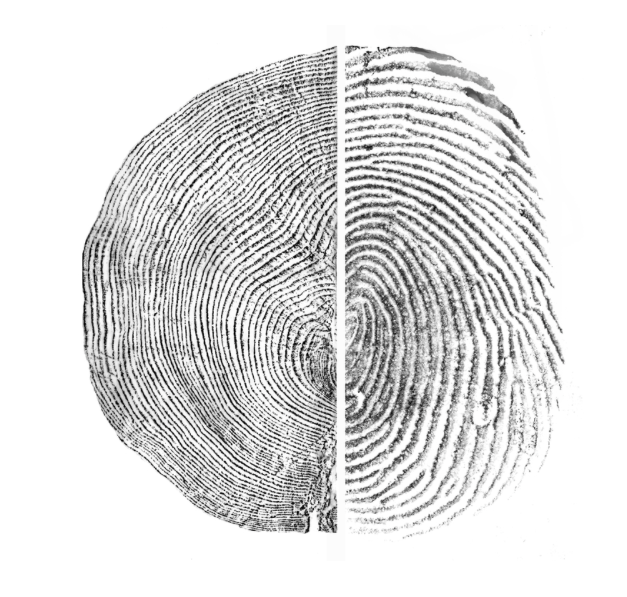 Anne will love this image for the tree rings and fingerprint equally. One afternoon over tea, I presented her with the cut-out image, she had a good laugh and then recalled the details of the story about her fingerprints. Anne was born in Canada and has lived in the U.S. for more than thirty years. In 2016, she began her application for U.S. citizenship. She passed all the requirements and tests with flying colors but she failed the fingerprint test. Her fingerprints were too faint to be positively identified as hers. She made three separate trips to the Department of Homeland Security’s Office of Citizenship and Immigration Services office an hour away to have her fingerprints recorded as part of her background check. After each trip, she was told that either the inking or the electronic scanning failed to yield a set of acceptable prints. Anne was also told that our fingerprints wear off as we get older. Anne did not consider herself “old” or at least not old enough to have worn her fingerprints off. What recourse did she have? She had to make a trip to the local police station to obtain a signed document confirming she had no criminal record. Anne became a U.S. citizen shortly afterward. What all her paperwork does not make apparent is her role as an upstanding citizen of the natural world; as an admirer and advocate of the border-crossing ecosystems, the forests, individual trees, and the birds that perch and nest in those trees wherever they are rooted; and her deep and unforgotten connection to the land and landscapes she visits. Anne is also an oral historian, a graceful and careful storyteller, and a popular columnist for the local Audubon chapter newsletter. She has a smooth writing style no whorls or spirals could possibly improve. But it looks so clean! Washington Governor Jay Inslee says tackling climate change is our state’s “hour to shine,” but we should be under no illusions about new forms of so-called “clean energy,” especially from wind turbines. But they look so clean! There they are, dotting the ridge lines across the landscape, turning their blades in the fresh breeze, harkening back to old-fashioned Dutch windmills or a brightly colored pinwheel toy from our childhood. What’s not to like? Much. I have just finished writing a set of public comments critical of the Skookumchuck Wind Energy Project—a 38 wind-turbine facility proposed to be built in Lewis County (south of Olympia, east of Centralia). Why do I get to criticize this project? Because the Lewis County Community Development Department determined the project will have a significant adverse impact on the environment. How ironic! Under state laws, this determination triggers an environmental review, In this case, the “environment” encompasses the habitat of several species of wildlife listed by the state or federal government as threatened, endangered, or in need of special protection and so these species are expected to be adversely impacted by the project. “Adverse impacts” generally means the species are at risk of being directly or indirectly killed or harmed by the project. Why am I concerned? Because this project, located on Weyerhaeuser property, is sited in the Pacific Flyway for migratory birds (68 species document at the site), is a place where both Bald and Golden Eagles are common, and is on the commuting route of the endangered Marbled Murrelet—the seabird that flies through the project area en route between the Pacific Ocean and/or Puget Sound to the west and north and its nesting habitat on federal forestland at the eastern edge of the project. The proponents of the project, RES-Americas, estimates that 2.496 Marbled Murrelets will be “taken” (killed) each year as well as 4.86 Bald Eagles and 1.65 Golden Eagles during turbine operations. They are not willing to take responsibility for adverse impacts to these birds or any other wildlife during the year-long construction phase of the project when birds could be at risk for colliding with turbines, towers, and get tie-lines. This means that over the 30-year lifespan of this “clean” energy project, we are likely to lose 75 Marbled Murrelets, 66 Bald Eagles, and 23 Golden Eagles, not to mention untold numbers of migratory birds as well as bats that occur in the project area. To its credit, RES-Americas has worked diligently to figure out ways to minimize the toll on these special-status birds and they have grappled nobly with the strange and somewhat unpredictable breeding behavior of the Marbled Murrelet, whose remarkable life history hovers on the edge of possibility. Since 2001, Washington state has lost 44% of our murrelet population. The loss of its nesting habitat—our coastal old-growth and mature forests—as well as the depletion of the fisheries that supply its food, oil pollution, and entrapment in fishing nets, and a host of habitat-degrading problems have all caused this decline. And then there’s climate change and its impacts on both the marine and forest ecosystems to which murrelets belong. To some the murrelet is doomed and therefore why not throw 38 spinning turbines and 120 transmission towers in its way? Why not log this parcel of land, or this one, or this one? There are so many forces at work against the murrelet’s survival that no one person, agency, or corporation could possibly be accused of dealing the fatal blow. If no one can prove that the Skookumchuck Wind Energy Project caused of the deaths of the murrelets nesting nearby, or contributed to the loss of the murrelet population barely hanging on in Southwest Washington, or proverbially hammered the nail in the coffin of the 4,913 murrelets left inWashington —then who is? The Washington Department of Natural Resources? The U.S. Forest Service? The U.S. Fish and Wildlife Service? Private timber companies? The salmon gill-net fisheries? There will be such a feast of finger pointing that guilt for this crime won’t stick to anyone. But we’ll all feel it. We’ll tell ourselves that we address climate change NOW! We must reduce human impacts on the environment NOW! We must wean ourselves from fossil fuels NOW! We need to divest our money and our souls from the dirty oil and the dirty coal that visibly pollutes our water, air, and soil. We need to tax the polluters, educate the wasteful, and “green” our economy! We need to install big, beautiful, white wind turbines across our landscape. Everyone for miles around needs to see us conspicuously generating clean energy! Few of us will see the hundreds of bird carcasses on the ground beneath these symbols of clean energy. That job will be left to an unlucky few hired to conduct carcass searches beneath the turbines. Has any one considered that the birds using the Pacific Flyway to move northward into a cooler climate may not be able to navigate through this clean-energy obstacle course? How many birds will fatally collide with the very turbines installed in part to reduce the fatal impacts of climate change on these birds? When operational, the proposed Skookumchuck Wind Energy Project will produce 137 megawatts of electricity. My annual electrical bill from Puget Sound Energy (PSE) is TK kilowatts. So this project could potentially power TK homes. Given the population growth in our region, this energy will not be used to replace but to supplement our current energy needs. The Evergreen State may become forested with forests of wind turbines—sterile forests where no trees grow and no birds sing. Frumpy cardigan aside, what’s wrong with an extra layer of fleece? How about turning your thermostat down to 65F in the day and 55F at night (you’ll sleep better, trust me!). How about unplugging a few energy-sucking appliances, electronics, and gizmos? 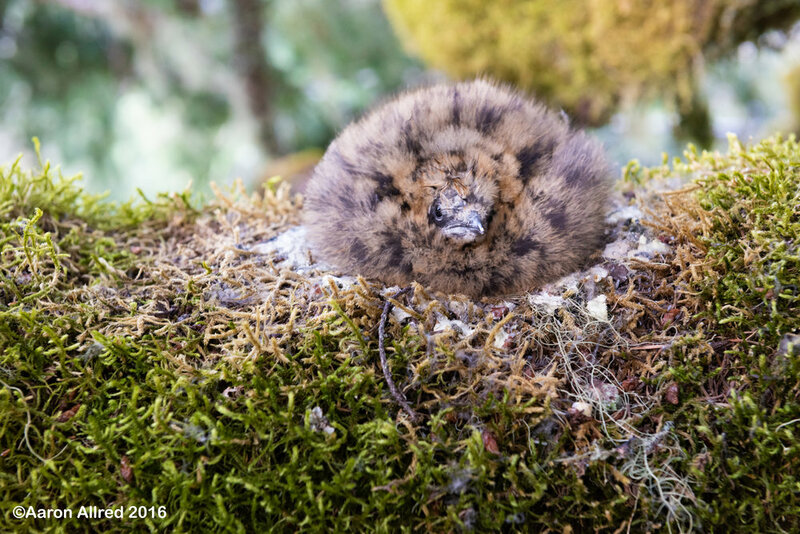 Would you not make some minor life-style changes to save a Marbled Murrelet? A Bald or Golden Eagle? What about a Peregrine Falcon, Pileated Woodpecker, Olive-sided Flycatcher, Vaux’s Swift, special-status bats, and any of the 68 migratory bird species flying in harm’s way? We expect bird, bats, and other wildlife to change their habits, to fly around or over thousands of acres of enormous turbines and towers and electrical lines, to forage and nest elsewhere, and to adapt quickly and successfully to whatever impediments we decided to place in their environment. As we modify and degrade wildlife habitat in the name of “clean energy” and “progress,” we are forcing our wildlife to spend get by with less. Because we refuse to do so ourselves. This is the dirty little secret clean energy. We can do better. Despite my criticism, the Skookumchuck Wind Energy Project has the potential to be a model project for Washington state and for any place where wildlife is abundant, imperiled, at risk. So everywhere. In my view, the project needs to be downsized. Operations of turbines needs to be curtailed during murrelet breeding season. And the investors need to rethink their expected (large) profits. There are plenty of very smart and motivated people developing new wind-energy technologies that don’t cause more harm than good. The American Wind and Wildlife Association is leading the way on this front. Check out this uplifting video that gives a glimmer of hope as we navigate our way through our energy crisis. Skookumchuck Wind Energy Project can help us find the win-win in wind energy. Here at the end of Daylight Savings Time and just days before the mid-term elections, we may have the opportunity to turn inward for some peace, reflection, and the coziness of home and hearth. These twinkling bells on my back garden gate in Olympia, Washington, used to hang on the white-picket gate of my late aunt’s home in Richmond, Virginia, where she lived from 1957 until her death in 2013. For those many decades, the bells were the welcoming sound to me and my three brothers, who spent many summers and holidays with my aunt, uncle, and two older cousins. The bells announced the transition from the driveway and the flagstone patio, backyard, and cozy Cape-Cod-style home where good cheer and real hospitality suffused the very air. These bells conjure up so many pleasant memories for me—but a book’s worth for my aunt’s daughter—my cousin—author and philosopher Marietta McCarty, who has just published a touching and tender memoir about loving and leaving her cherished childhood home. Bereaved following her mother’s death, Marietta faces the daunting task of emptying her family home—number 1203 on a narrow avenue (really a lane). How, she asks, might she find her way through the emotional turmoil and the accumulation of more than five decades in the house at 1203? Call an appraiser? Schedule an estate sale? Call the Goodwill? Where to begin sorting the furniture, the objects, the intangible memories, the valuables, the junk, the items useful to someone somewhere? What to keep, what to let go? Overwhelmed at times—and justifiably so—Marietta takes one day at a time, one room at a time, one corner of the pantry, basement, and garage at a time. With the help of friends, families, and strangers, she navigates her way through the months-long process, balancing tears and laughter all along the way. Putting myself in my cousin’s shoes, I believe I would have boxed up most everything in 1203 and made room for it in my house. I would have gotten rid of all my furniture and made space for the pine tables and cabinets and handprinted furniture. I would have attempted to recreate my blissful childhood by keeping all the things that transported back through the decades of life and to a simpler time. But no. The is not the philosopher’s way. Marietta gives it all away. (You’ll have to read the book to find out how). And in so doing, honors the memory of her mother, father, grandmother, and all those who will forever hear the bells welcoming them to 1203 and bidding them a sweet farewell after a beautiful visit, a beautiful time. To read more about Leaving 1203 (and to order a copy) and about Marietta and her other books, click here. We need more books like this one now—more than ever.